Currently, personalized learning is seen as a large umbrella under which many practices fit, each designed to accelerate student learning by tailoring instruction to individuals' needs and skills as they fulfill curricular requirements. We must create the conditions for all educators and students to become immersed in learning experiences in which they have some control over the pursuit: access to information and ideas; regular opportunities for feedback and guidance; and parameters (e.g., sufficient time, clear criteria) that honor the messiness of the work. Their attitudes and dispositions are pivotal to successfully being able to handle the complexity of challenges, problems, and tasks within and beyond school walls. 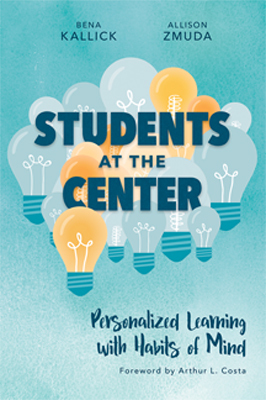 This webinar introduces participants to the ASCD book Students at the Center: Personalized Learning with Habits of Mind, where authors Bena Kallick and Allison Zmuda describe the four attributes that are at the heart of personalized learning: voice, cocreation, social construction, and self-discovery. A school's culture must have a clear vision of how it includes and advocates for student voice; provide opportunities for students to cocreate their learning experiences; develop students' social construction by reaching out to all kinds of resources and expertise; and make certain that self-discovery becomes a driver of students' metacognition. The authors will explore practical examples and actions that are relevant to you—wherever you are on your personalized learning journey. Bena Kallick is the co-director of the Institute for Habits of Mind and program director for Eduplanet21, a company dedicated to online professional learning and curriculum development based on the Understanding by Design® framework. She is a consultant providing services to school districts, state departments of education, professional organizations, and public agencies throughout the United States and abroad. Allison Zmuda is going on 17 years as a full-time education consultant specializing in curriculum, assessment, and instruction. She is passionate about and excited to be a part of the personalized learning movement, working on site with educators to make learning for students challenging, possible, and worthy of the attempt.